Lindamade » Independence Day Sale! Since both Paul and I are work-on-weekends type of people, we aren’t really doing anything to celebrate unless you count pushing our noses to the grindstone. But I was inspired to dig up this photo of me and my sisters, Mary Ann and Anne Marie (as we called them then) on our way to the 4th of July parade in 1988. 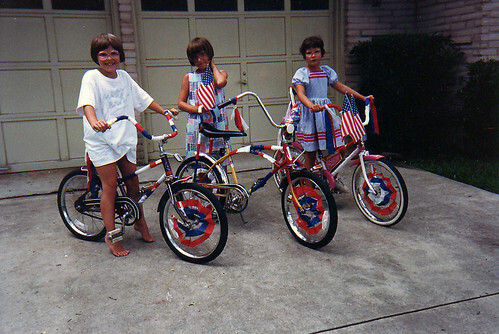 We always had fun decorating our bikes with crepe paper, balloons, and the like for the event. That seems like such a long, long time ago! My dad was always good about taking photographs, and for that I am thankful. Have a happy 4th, however you celebrate it!